He added that the industry has dealt with the issue several times in the past. 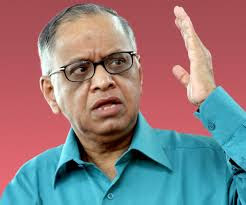 Murthy said he has no doubt that all industry leaders have good intentions to solve the problem of layoffs. "There are a lot of smart leaders in the industry, but I have no doubt at all that they are all well-intentioned people and they can find solutions," he told news channel ET Now. Murthy also said this is not for the first time that the industry has faced the layoff problem and hence there should not be any extreme anxiety as the industry had dealt the issue and found solutions then. "Let us remember we have gone through this several times in the past. We went through that in 2008, in 2001. So, this is nothing new. Therefore, there is no need for us to become extremely anxious. We have had solutions to such problems in the past," he said. The senior-most people at the internal director level took the highest pay cut, and then to follow suit was the senior vice president who took a slightly lower cut, Murthy said. Murthy said Infosys did this in 2001 when the market shrunk. "Let me give you example of Infosys itself. When the market became very tough and it shrank actually in 2001. We all sat together with senior management and then we said - look let us make some sacrifice and ensure that we protect the jobs of youngsters," he said.